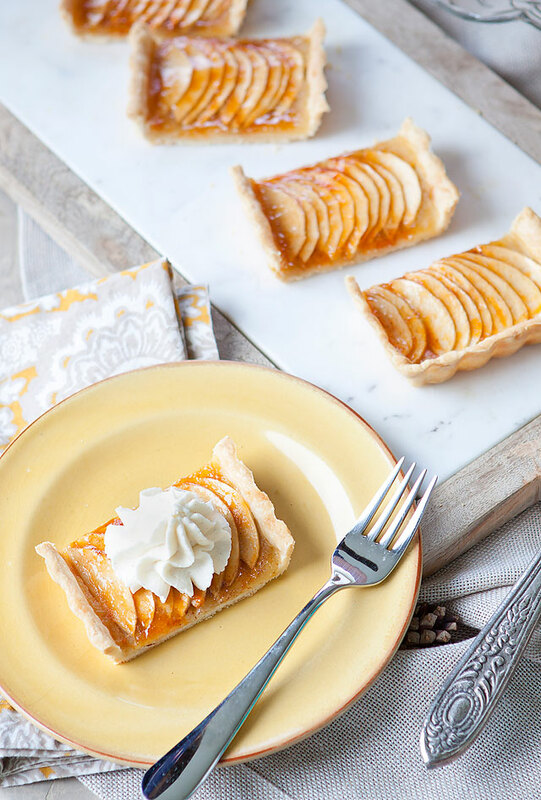 French Apple Tart was always a staple in my household growing up, and it still is. It is usually served at Thanksgiving or on our Christmas table, and stems from my French side. It is always a show stopper, and always tastes as good as it looks! French style apple pie is my favorite because the apples are lined up so thin. I prefer it that way vs the American Apple pie. A nice thin layer of apples is the perfect amount for me! 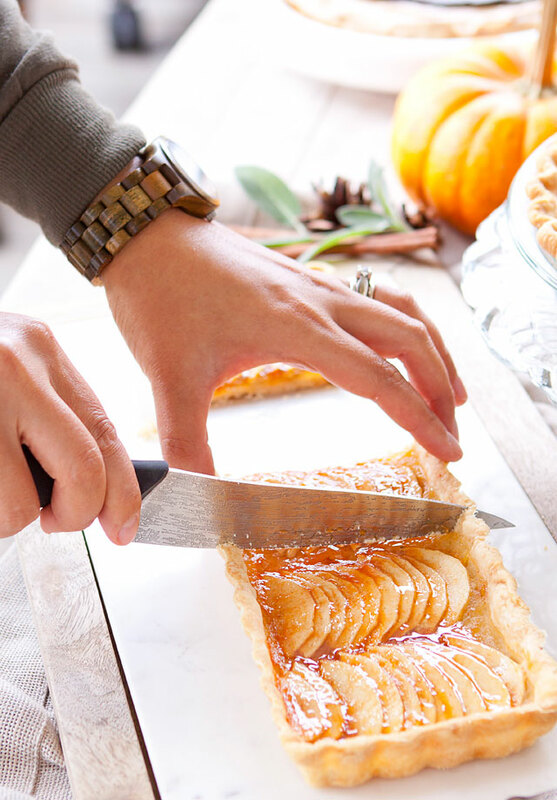 I am teaming up with Harmons Grocery today, and all the Harmons Bloggers to bring you some of our favorite pie recipes (see all the links at the bottom for more pie recipes and ideas!). We hope that you can get some good ideas for the upcoming Thanksgiving holiday. 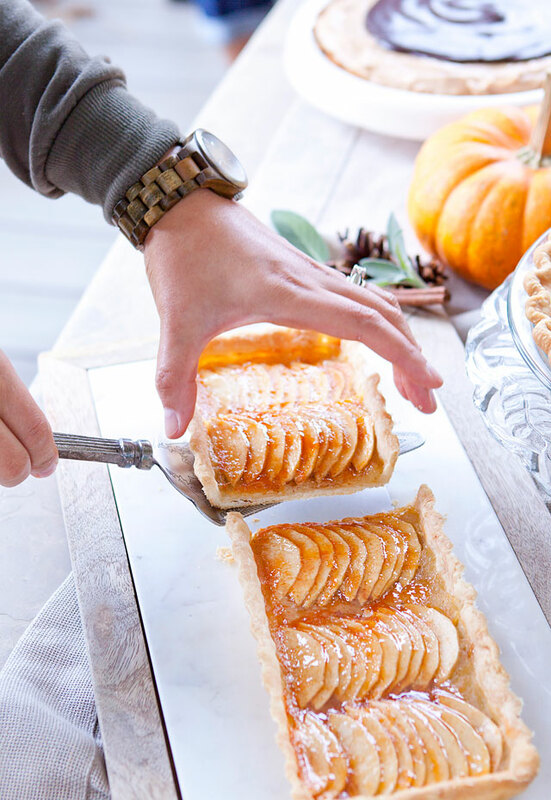 Pie season is just around the corner! 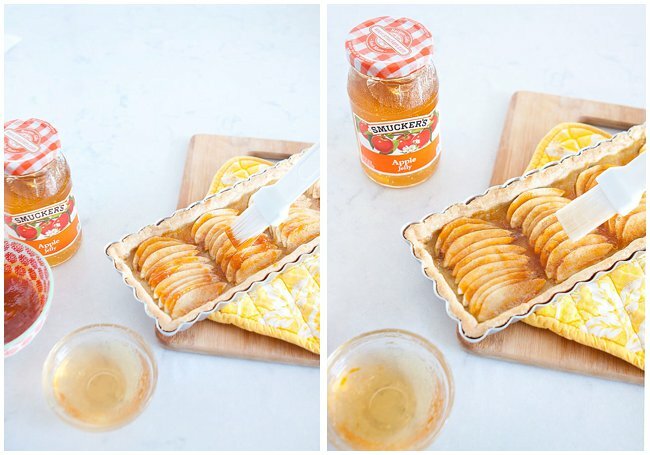 French Apple Tart is a pretty simple pie to make. Once you make your dough, it all comes to together nicely. 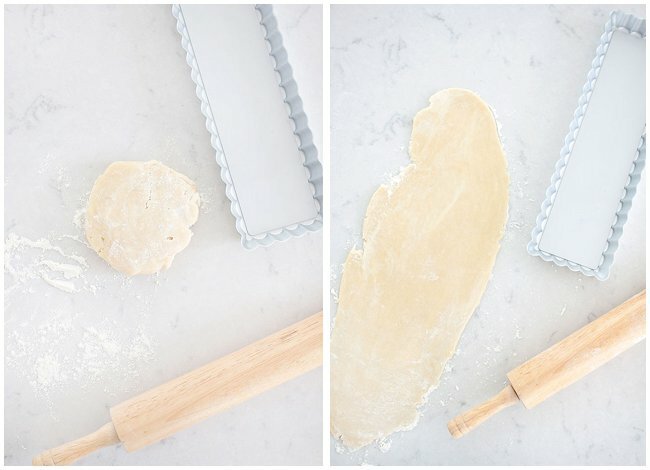 Homemade pie dough is a must for me when it comes to pies. A homemade dough makes all the difference in my opinion. It doesn’t take long to make the dough either. 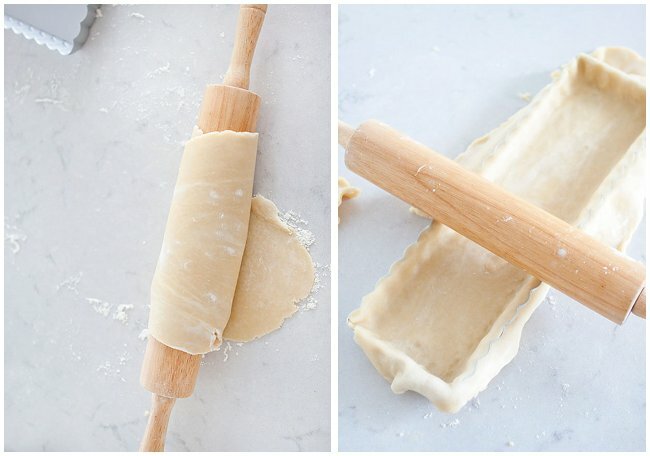 After I make the dough and roll it out, I like to carefully roll it up onto the rolling pin, then carefully roll it back out onto the pie tin I’m working on. Then, for a straight edge top pie tin, I take the rolling pin, and roll it across the top to cut off any excess edges. Next, I take fork, and poke some holes in the bottom of the dough, then I allow it to chill again for a few minutes. Add a layer of applesauce and some cinnamon sugar. Peel and slice the apples thin. 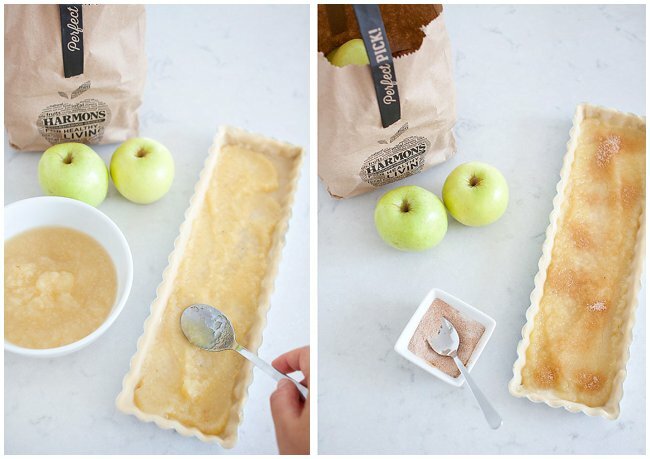 Fan them out, and place them over your applesauce and cinnamon sugar. Add a little cinnamon sugar to the top, and some little pieces of butter then put it in the oven to bake. After it bakes add some apricot preserves, and apple jelly to finish it off. 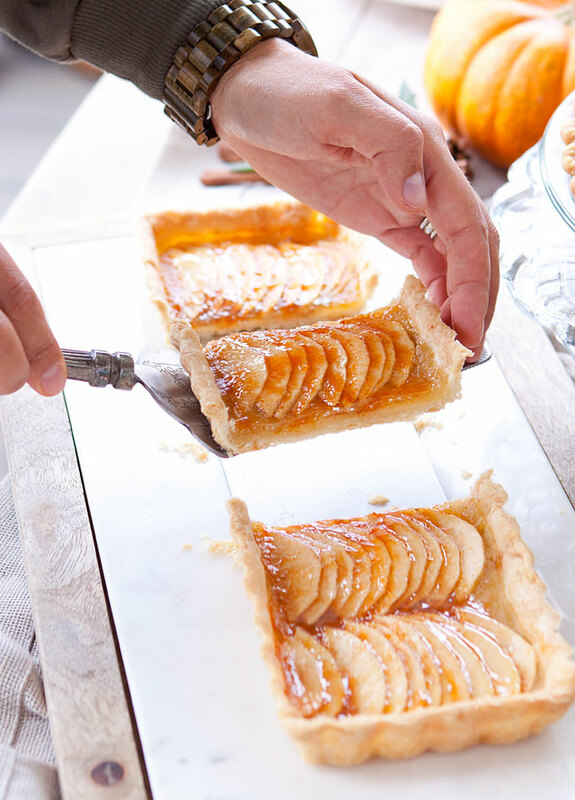 It not only adds a beautiful shine to the top of your tart, but also an amazing flavor! Place the flour, salt, and sugar in the bowl of a food processor, and process for a few seconds to combine. Add the butter, and process until the mixture resembles coarse meal, about 10 seconds. With the machine running, add the ice water in a slow, steady stream, through the feed tube, just until the dough holds together. (you may not need to use all the water) Do not process for more than 30 seconds. Turn the dough out onto a work surface. Divide in two. Place each half on a sheet of plastic wrap. Flatten, and form two discs. Wrap, and refrigerate at least 1 hour before using. 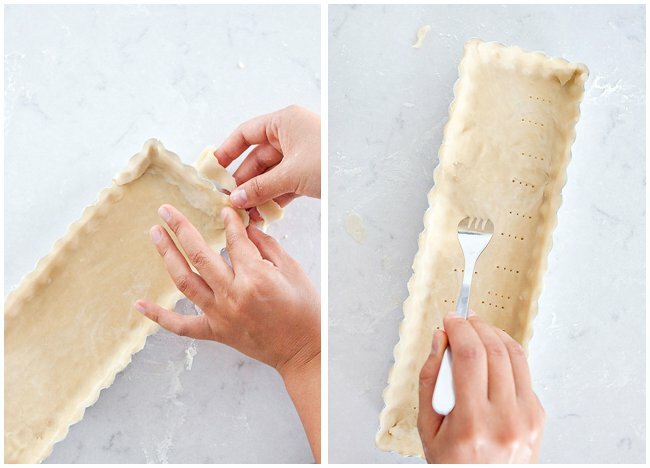 Roll out onto a tart pan, and poke holes using a fork along the bottom of the crust. 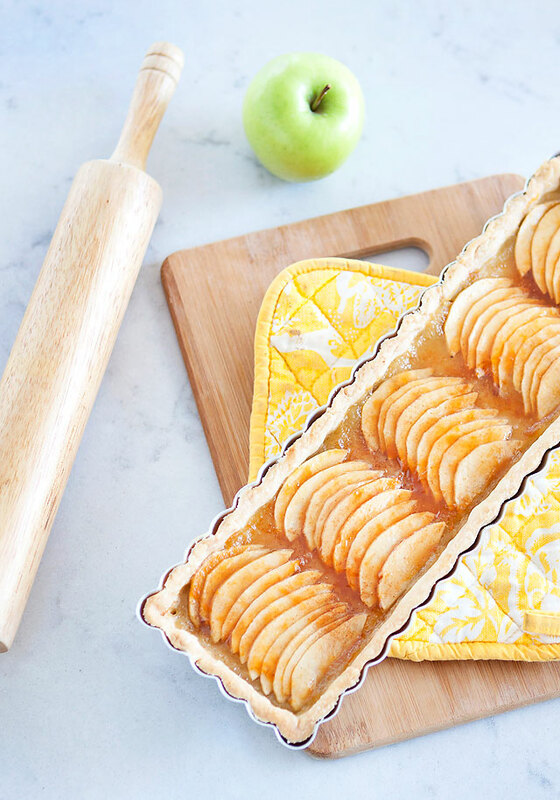 You can use two rectangular pie tart tins, or a round. 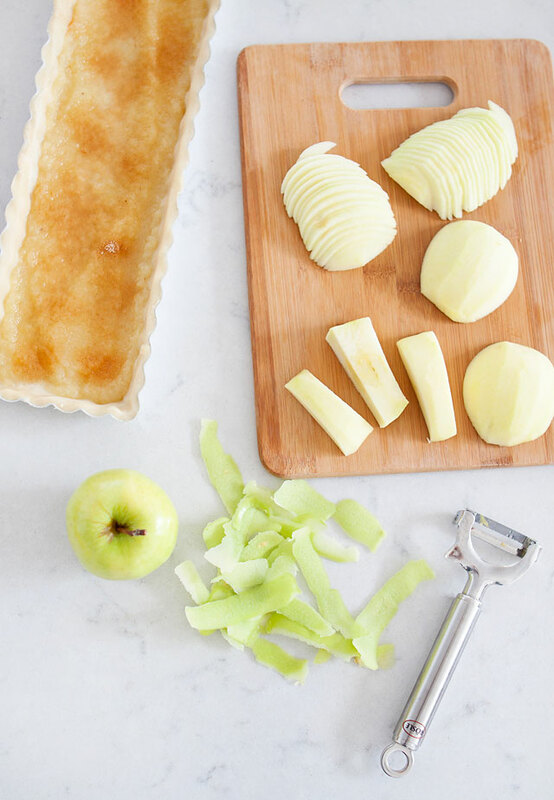 Spread a thin layer of applesauce onto the un-cooked pie crust. 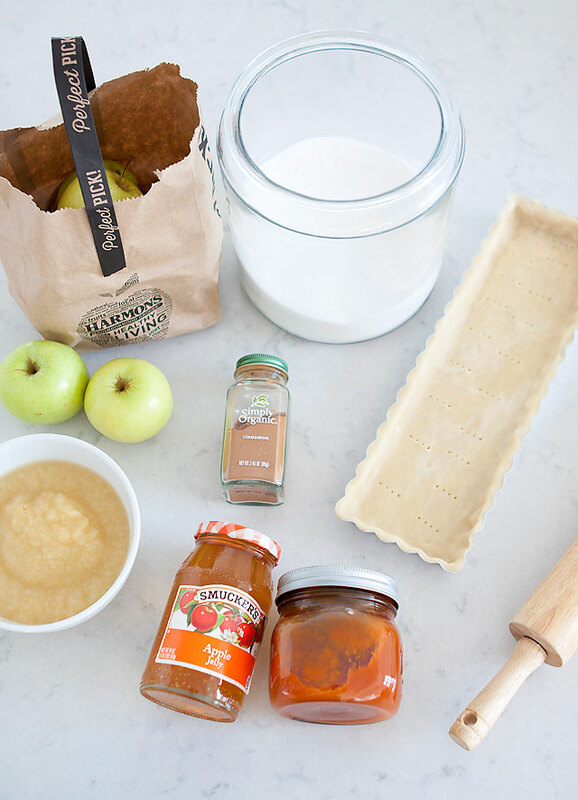 Mix together sugar and cinnamon and spread half of the mixture over the applesauce. Start layering apples in a nice pattern over the applesauce. Sprinkle the remaining cinnamon sugar mixture over the apples. 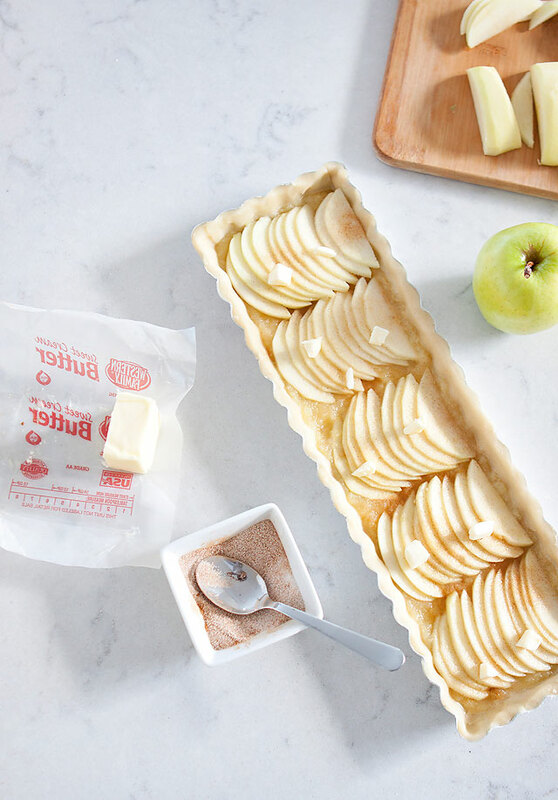 Place butter pieces evenly over the top of the apples. Bake in a 375 degree oven for about 45-60 minutes or until apples are golden and the dough is cooked. *check halfway to see if edges of dough is too brown or starting to burn. if so take some aluminium foil and line the edges so the showing dough edges will not burn. Heat apricot preserves with water in the microwave for 30 seconds. (Optional: strain out the preserves for any large chunks) Brush a thin layer over the apples. Put ½ cup of apple jelly in the microwave for 30 seconds. And, finish off with brushing a layer of apple jelly. Allow to set for at least 20 minutes and serve with ice cream or fresh whipped cream. 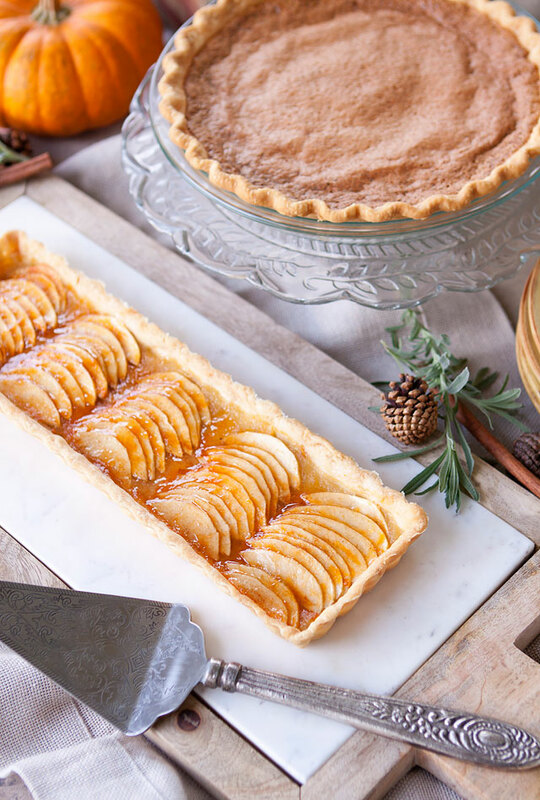 I hope this French Apple Tart becomes a tradition at your Thanksgiving table as it has been at mine! 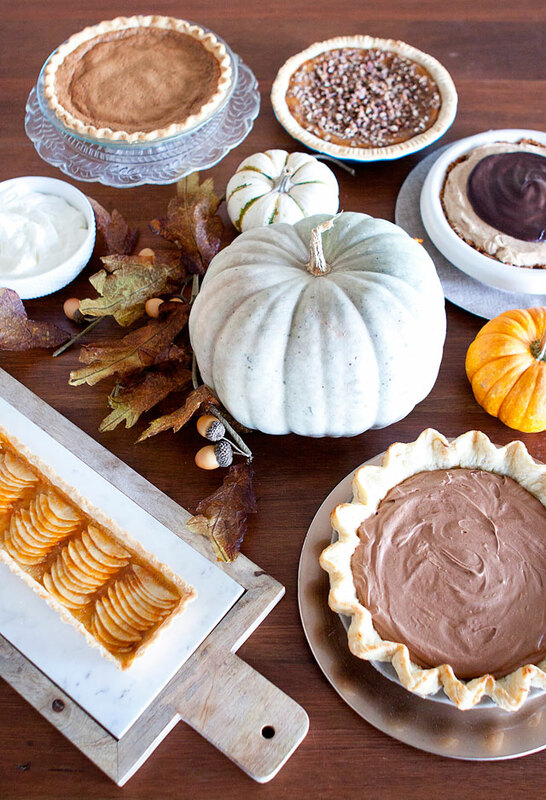 And, for more ideas and recipes for a nice pie table for your Thanksgiving feast, be sure to see my round up of the Harmons Bloggers Holiday Pies! This tart was so pretty! I love how you layered the apples and the vanilla whipped cream was like the cherry on top! Such a beautiful tart! I can't wait to make this one! Loved how elegant this pie was! And it looks like its pretty easy to assemble too! Great recipe friend.